"A creature who lives without borders in a world we can hardly fathom. Yet millions live among us... in captivity." So begins Parrot Confidential, an hour-long documentary about the U.S.'s current pet parrot crisis and the plight of their wild kin. Created by the award-winning wildlife documentary production company ArgoFilms, it premiered on the PBS Nature channel last November. 1. Nearly a third of all wild parrots are endangered. A dire statistic. Why? Habitat loss and poaching are likely the biggest reasons. 2. Captive parrot estimates range from 10 to 40 million in the U.S. alone. The illicit trade in wild birds is a multibillion dollar, world-wide industry. In 1992, after the U.S. banned the importation of wild birds, domestic breeding boomed. Now, there is a huge problem arising as thousands of unwanted parrots -- which can live up to 90 years old -- are being abandoned by their owners. 3. Parrots are complex creatures, "right up there with apes and humans." Bird brains, schmird brains. With a large brain, highly advanced language skills, and leading complex social lives in the wild, let's face it: parrots are almost on par with, well, us. They speak in regional dialects, can differentiate between colors, and exhibit a variety of behavioral qualities; including, as one rescuer puts it, the ability to "carry emotional baggage." 4. Parrots form "mate bonds" with each other-- and their owners. Are parrots capable, then, of love? Watching an abandoned cockatiel meet a female member of his species for the first time, or hearing a female Amazon parrot heartbreakingly cry, "No! No! No!" when separated from Basil, the only other Amazon parrot she's ever met (both moments caught on film in the documentary), it's tempting to believe so. What we do know for sure, though, thanks to the work of field biologists like Dr. Tim Wright, is that parrots "are very tightly bonded with each other," a mechanism they've evolved to ensure the survival of their species in the wild. "If kept in captivity, they then try to recreate that bond with whoever's around." Santa Barbara Bird Sanctuary director Jamie Mcleod says that "people don't always understand that when a bird forms a bond with you, it's actually a mate bond. They're not just part of your life. They become your life!" Considering many parrots will already outlive their adult owners, as well as our current inability to seemingly endure long-term commitments with members of our own species (divorce rates and all), it's obvious we've got a big problem on our hands! Also, early on in the film, we meet Basil's owners Russ Hartman and his wife, a couple who enthusiastically bought the parrot shortly after getting married. A delight for the first four years, once he reached sexual maturity, he bonded with Russ, and became so attached to him that he began attacking and biting Russ's wife and even, subsequently, their children. In fact, maturing parrots often exhibit similarly drastic behavioral changes. 5. Captive parrots are still "wild" animals. "In a cage, or soaring above the canopy, parrots are still considered wild," croons the documentary's narrator. Only a few generations removed (or less) from the freedom of their natural rainforest habitats, unlike dogs and cats, they haven't been domesticated (a process that takes hundreds of years). 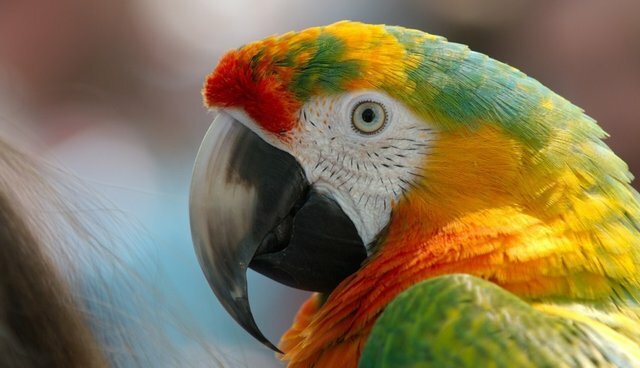 For this reason, no matter how excited they were to purchase a parrot in the beginning, many people are unable to endure the constant squawking without gun range-quality ear protection (like one owner), and are finding it impossible to keep them in their homes for more than a few years, tops. Says Jamie, who used to breed parrots, but now devotes her efforts entirely to re-homing abandoned birds, "Many people come in and say, 'I want a bird that talks, is quiet, and doesn't bite.' And I say to them, 'I'm sorry, but that species has not been discovered yet.'" Considering that parrots in the wild can fly up to 50 miles in a day, keeping them alive yet cooped up in a tiny cage can also seem akin to torture. Couple their evolution for flight with their intelligence, and bored, otherwise healthy birds can often start physically suffering from a clipped-wing, sedentary life in captivity... ultimately succumbing to a chain reaction of health issues starting with increased stress and leading to feather plucking and even heart disease. Marc Johnson, who runs Foster Parrots (a sanctuary situated on an old chicken farm in Rhode Island that gets over 1,000-plus calls a year from owners seeking to surrender their birds) says poignantly regarding the "right" size cage for a Macaw: "There is no 'right' size. 35 square miles is the size. It's the sky." Jane Goodall, who has endorsed Foster Parrots, has stated, "For me, the sight of a parrot living alone, living in a cage, deprived of flight, miserably bored, breaks my heart. And the parrot's too, perhaps." 6. Be wary of adopting an animal as a pet just because it's "at the top of the YouTube charts." Marie Crowley, a Detroit housewife who runs a parrot rescue dubbed Feathered Friends straight out of her basement, appeals to us to curb our enthusiasm for cute critters who are at the peak of their popularity. As we watch Marie nurse a nicotine-addicted and severely neglected African Grey parrot named Fagan back to health, she cites the popularity of "Alex," the famous African Grey trained by Irene Pepperberg for the recent boom in Grey parrot purchases, then subsequent surrenders by scores of ill-advised and unprepared owners. "As long as they're at the top of the YouTube charts, they're at the top of my surrender charts." 7. Taking on a parrot is a lifelong responsibility. The heart of the issue, as the movie states, lies not only in the fact that the parrots are wild animals that probably shouldn't be kept as pets, but in their human guardians' repeated failure to prove themselves as appropriate companions to and for the birds. To combat the rates of abandonment of captive wild birds, not only do people need to be better educated about the commitment they are making, but pet stores could do their part by making more attempts to regulate the current supply and demand. According to sanctuary owner Phoebe Linden, right now, "anybody with $40 can walk into any PetCo and buy a parrot. There are no regulations. [You] can have as many as you want. You can breed them, you can sell them." Adopt birds, don't buy. Avoid adding to the demand for captive-bred birds, while also helping to alleviate over-burdened sanctuaries. Try to think about how you can better improve the bird's life, and take the time necessary to do so. According to Johnson, "from the very first day" he got his first Macaw, "my resolve was to make his life better, every day." Also, enrichment activities and games help keep parrots' minds active and have been shown to reduce stress. Always remember: There's no such thing as a "perfect" pet parrot. Echoing her earlier words about a certain type of parrot that "has yet to be discovered," says Jamie McLeod, "being injured by a parrot, you can't be angry with them. If you take them into your life, that's one of the things you need to accept. It's still a wild animal." 8. With numbers so low in the wild, every bird counts. Conservation is key. As parrot numbers dwindle in the wild, the amount of abandoned & captive-bred birds is currently on the rise. While most captive-kept adult parrots can't be released into the wild, considering their lack of necessary survival skills and the risk of disease transmission, has raised and released over 100 disease-free Macaws (after putting them through a specialized "Macaw boot camp" where they practice cracking nuts and finding the right foods), with an 85% survival rate. As a child, I remember spending afternoons making lists of all of the animals I hoped to have when I grew up one day, and #1, at the top of the list, was always a Scarlet Macaw. Now, after watching this film, I don't want a Scarlet Macaw. I want to return to Costa Rica, one of the species' last strongholds, where I've witnessed wild flocks soaring past the balcony of my room at an ecolodge, and donate my time to The Ara Project! Watch the complete documentary online right now at pbs.org/nature, or visit shoppbs.org to buy the DVD.